“Louise Bohmer is clearly an author who has taken the time to plan out the details of the fantasy world in the Witch Twins Saga in her mind. While the author is an expert of her world, the reader may not immediately be. While the book does not just throw the reader in the middle of the action without some sort of explanation of the magical world Claire and Anna live in, it does not detail every aspect of the society. I got a vague idea of some sorts of going-ons, but to really get an idea of what was happening, I had to continue reading. The world slowly opened up to me and it became easier to learn individual’s roles and homelands and histories as the book went on, but they were not the clearest things to understand, especially in the beginning. I feel like more would be explained by reading the second book as well and maybe also rereading the first book. Thanks again, Shaya! You can read the full review here. And you can grab Witch Twins Born for free at Amazon, Kobo, and Smashwords. Plus Book 2: Witch Twins Secrets is now available for under a dollar. Just click the links here, visit The Black Act page, or click the book covers below to grab your copies. Book 3: Witch Twins Cursed will be released sometime in August, and I’ll be posting a cover reveal soon! Hope July has been treating everyone great wherever you are. We’re busy getting ready to move, which means lots of apartment hunting in our near future. And lots of boxes. Ugh, I hate packing. 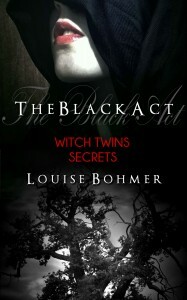 I wanted to share with you a sneak peek at the book cover for The Black Act Book 2: Witch Twins Secrets. I’m hoping to have part two of the serial out by July 15. For now, don’t forget you can grab The Black Act Book 1: Witch Twins Born for free at Amazon, Kobo, and Smashwords. You can also visit The Black Act page here to grab the first book in PDF. Thank you for the downloads, and for making Book 1 #13 in Kindle Store > Kindle eBooks > Teen & Young Adult > Science Fiction & Fantasy > Fantasy > Coming of Age! Cover art by me. You can view more or query about cover art here and here. Just popped in to let you know The Black Act Book 1: Witch Twins Born is now free at Amazon. Click the highlighted text here or the book cover below to grab a copy now. Thank you bunches for helping me get the book free over there, folks. I’d hug you all if I could. It’s sitting at #37 in fairy tales. Whoop with me! Keep watching for a sneak peek at the cover for Book 2: Witch Twins Secrets coming soon! I hope June is treating you all great wherever you are. Things have been wet here, but the sun is fighting back and we’re getting some nice weather now. Also, I finally posted pics of Abigail, the new puppy, over at FB. Take a peek here if you like. And The Black Act page is now live. Click the highlighted text to visit it now. The first book is up there, plus an excerpt, the old book trailer and cover from the original release, and faery inspiration pics. You can also click on the banner below to visit. I’ll soon be adding a PDF of the first book you can download. In the next couple weeks, I’ll be posting a sneak peek at the cover for Book 2: Witch Twins Secrets. I’ve also spruced up my FB author page with the book cover and banner for the new release. Click the highlighted text to take a peek and like the page. Thanks again for the downloads and sales, readers! It’s greatly appreciated. Also, don’t forget that Witch Wars: Anti-Heroes Book 6 is coming soon! And it will be an explosive conclusion to our adventures with the Anti-Heroes. Now I’m off to eat Indian food and drink coffee. Have a good one, folks! 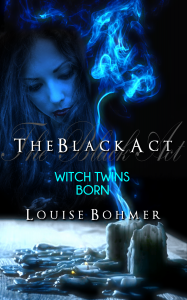 The Black Act Book 1: Witch Twins Born is now available for free at Smashwords and Kobo. I’ll post an update when it goes free at B&N (you can grab it for under a dollar there now). It’s also live at Amazon for 95 cents, but if anyone would be kind enough to report it to Amazon as free elsewhere (you can find the report link at the bottom of the product details) this will help me get it free on Kindle also. And I’ll love you forever. And send you house cleaning and dish washing fairies. For real. Even ones that will fix your car. No kidding. Anyhow, click the links above or below to grab a free copy now! Over the next couple weeks, I’ll be adding a page to the site for The Black Act, where I’ll post the maps, reviews, and other tidbits. And The Black Act Book 2: Witch Twins Secrets will be coming soon! I’ll post a cover sneak peek in the next couple weeks as well. Be sure to check out the free reads page here, too. Soon I’ll be adding The Black Act Book 1 and Anti-Heroes Book 1 to it, and I’ll include direct downloads of the PDF, MOBI, and EPUB versions. Blurb: This is a serial fantasy novel that will be released in regular installments. Watch for Book 2: Witch Twins Secrets coming soon. In Book 1: Witch Twins Born Claire begins to confess the truth to Anna, and Anna discovers her twin is having an affair with a woodman named Luthien.